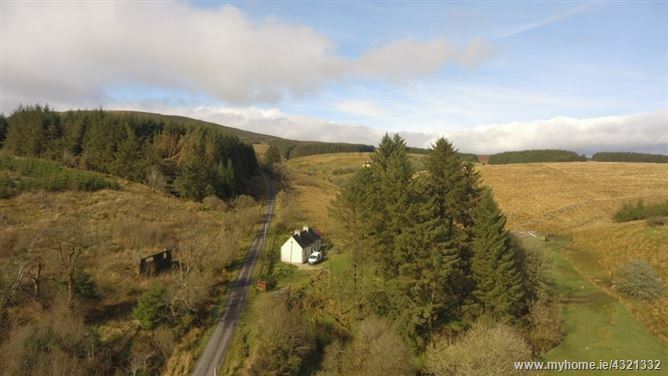 DNG Cregg O’Callaghan are proud to present this entirely renovated two bedroom bungalow located in the unspoilt area of the Bencroy and Sliabh an Iarainn Mountains. Located close to the peak of Bencroy this home has much to offer with on the main walking route and reknown for its scenic beauty. 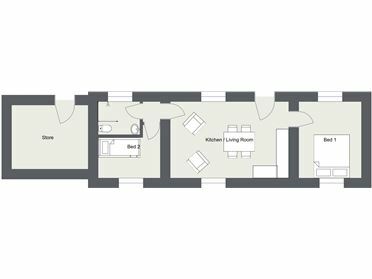 The home itself has been modernised to offer all modern conveniences with a dual heating system of modern oil burner located in the side, insulated store room and a revamped Stanley 6 solid fuel range in the kitchen / living room. The Stanley 6 range is set into the original, large open fire surround creating a beautiful focal feature within the living room. The home contains one large double bedroom and also a smaller bedroom which currently hosts a set of bunk beds. The home also has a main bathroom with shower unit and also a small Stanley solid fuel stove in the main bedroom. The home has been entirely renovated with new double glazed pvc windows, spray foam attic insulation, drylined walls and a new modern septic tank. This home lies on the roadside on a large site of more than one acre. The plot offers natural beauty with a meandering river running the length of the property and surrounded by large mature trees. The river runs under a stone bridge and to a further plot of river on the opposite side of the roadway. 19 Abbey Street, Roscommon, Co. Roscommon.